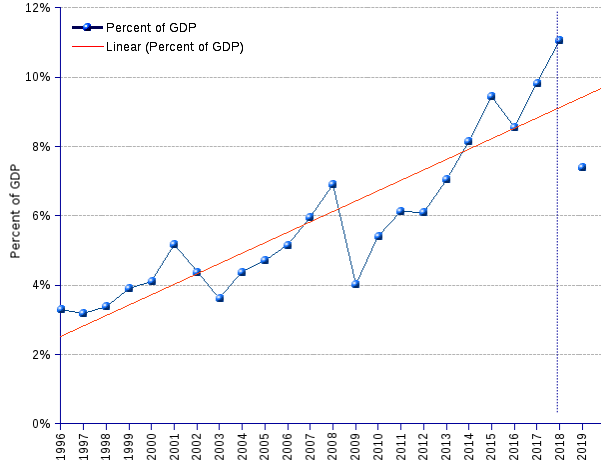 World billionaires' aggregate net worth as percent of GWP (gross world product) has been on a fast ride since 1996, as highlighted by the trend (red regression line). In 1996 the whole world should have to work 8 solid days to produce an output equal to the total net worth of the then existing billionaires. In 2018 the world would have to contribute an additional 14 workdays, bringing the total to 22 days, to match the wealth of the contemporary 2,208 billionaires. Manner of speaking, it is a fact that the ordinary worker is aberrantly munificent. Further to give away between one third and one half of his work to the tax office, he still provides some hard work to make billionaires richer. No joke, that is what the figures tell. Between 1996 and 2018 GWP grew at the annual average rate of 2.5%, while the billionaires' wealth grew at the rate of 8.3% each year, climbing from 3.3% to 11% of GWP. To put it plainly, billionaires have been deflecting to their balance sheets a growing share of the world's output, crises or no crises. From an economics vantage point, a lot could be said about the pros and cons of this transfer of wealth to the richest. In a nutshell, the standard thinking claims that a dollar to the rich is money that trickles down to the poor, through consumption or investment. Hard facts show that it is mostly baloney. The accumulated wealth is vastly used to finance operations aimed at increasing the value of the stock portfolios. The impact on the quality of life of the average person is devastating: unemployment, precarious jobs, lower and insecure income, indebtedness, economic dependency, failed public economy, and so on. Not to speak of the deleterious ecological effects of consumerism, or the eroding social consequences of the inequality chasm between the 2,153 billionaires and the 731 million poor at $1.90 a day. Crises exist indeed, they are a veritable affliction for common people. At this very moment, beginning of 2nd quarter of 2019, alarm signs are red: another world crisis is looming and everyone is getting the jitters. For billionaires, however, crises are a mere flash in the pan, if not an helpful lever to push their fortunes further up. Both the 2001 dot.com burst and the 2008 global financial meltdown have been quickly outdistanced. The 2015 depression caused murderous commotion among world billionaires, to an extent unparalleled since 2009. In 2016, 221 billionaires got wiped out of the billionaire list, and their aggregate wealth sunk by one percent point of GWP. But the course returned to normalcy in 2017. In hindsight, the 2008 crisis looks like the first visible tumor of a metastatic cancer that has been spreading alarmingly thereafter. Global economic uncertainty is peaking at the present time. Consumption and investment are sluggish. The skies become the more menacing as the monetary policies of zero or negative interest rates, and of the germane increases of the money supply, courtesy of the central banks, keep flooding financiers with inexpensive capital that ends up overwhelmingly in the assets of the wealthiest. The profligacy of government spending, especially sterile defense spending, adds to the turbulence. Symptoms of the metastasis are ubiquitous. The instability of international currencies. The equity-market pandemonium. The commodities debacle (oil at the top of the list). The creeping unemployment. The standstill of labor income. The climbing indebtedness of both public and private economic agents. The shrinking redistribution by the state. All of the above impact the poor as well as the wealthy. But they come harder on the regular consumer and the regular taxpayer, rendering their lives more difficult and more hazardous. Billionaires, as a caste, have demonstrated their power to stand the test virtually unscathed. ¹ GDP is the GWP (gross world product) through 2018, and the sum of GDP for the home countries of the top 500 billionaires thereafter. GDP values are the most recent provided by the World Bank at the time of the building of the table. ² US$ constant (2012=100) are estimated by applying the US$ GDP deflator for the preceding year. ³ Partial data from Forbes. Until 2018, datasets are sourced from compilations by Forbes List of World Billionaires. From 2019, the source used is the Bloomberg Billionaires Index, for reasons given here. Sources: The Bloomberg Billionaires Index, 2019, The Forbes Billionaires List, The World Bank-DataBank.